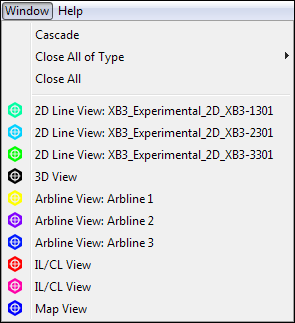 DUG Insight can display multiple windows of any view type, except for the specialized 3D View. The different views are available from the View menu in the Control Panel. After choosing the type of view to create, Insight will open a new window. By default, the location and scale of new view windows are linked to match existing windows. By default, the volume is not linked, allowing you to display different volumes for the same location. 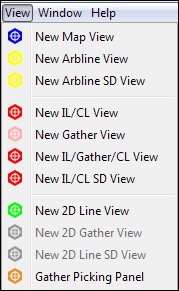 For example, when you move to a new inline/crossline (IL/CL) location in one view, all other views that display the same volume will get updated simultaneously. Linking is controlled In the Display Settings for a view. To view different locations, scales, etc. in a view, unlink the location and vertical position as needed. For more details on linking and linked view behaviour see Linking Multiple Views. The cursor crosshair shows the current position of the mouse pointer on all views. This can help maintain spatial awareness. Open views can be managed using the Window menu in the Control Panel (see Window Menu). 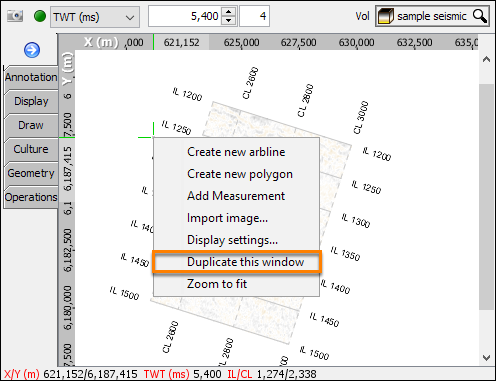 To create a copy of an existing window, right click in the main panel and select Duplicate this Window. Insight will open a duplicate of the window.